It said the 12 months to the end of September 2018 saw a 35% increase in the consolidated net worth of MSP and its subsidiaries from £58.3 million to £78.9 million. MSP’s city centre campuses, Manchester Science Park and Citylabs, which are in the heart of Manchester’s Oxford Road Corridor innovation district, offer lab and office space for digital tech and life science businesses. Combined, the Oxford Road Corridor campuses tripled profits from £4.7 million to £17.2 million as occupancy levels increased and property valuations rose. At Alderley Park, profits increased from £7.5 million to £19.4 million during the year, which also saw the announcement of £10 million of investment in the development of new laboratories for smaller life science businesses. 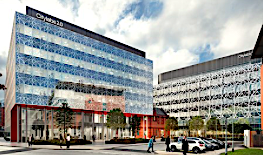 The period also saw the creation of Bruntwood SciTech — the UK’s largest property portfolio dedicated to driving the growth of the science and technology sector — in a landmark equity deal between MSP majority shareholder Bruntwood and Legal & General. Bruntwood SciTech announced pre-tax profits of £53 million together with shareholders’ funds of £234 million. Bruntwood SciTech has plans to grow the value of its portfolio from £330 million to more than £2 billion in the next 10 years.